Coast 2 Coast Convention 2012 was a huge success and we thank all of our participants! Book your tickets for the next Coast 2 Coast Convention coming to Miami Labor Day Weekend 2013! Check out the video below and the lineup for Coast 2 Coast Convention 2012 to get an idea of what we will bring for 2013! Buy early bird tickets and save BIG! BOOK DISCOUNT HOTEL ROOMS NOW FOR $109/NIGHT! 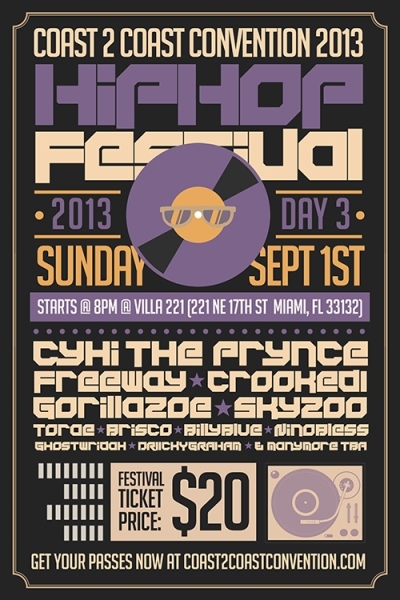 JUST ADDED COAST 2 COAST HIP HOP FESTIVAL FOR 9/1!